This is bound to come up here in #louisvilleCO sometime, given the city wants to expand downtown, and doesn’t have a parking solution. Back in my old town, Austin Texas, it’s still a thing. I read this excellent blog post by Meghan Skornia. I’d like to have commented on her blog directly, sadly it requires a facebook ID, which regular readers will know, I don’t have anymore. I tried to reply via twitter but it was typo-ridden and out of sequence. So, here it is with corrections. I lived on the 600-block of W Johanna St for 10-years. The block west of S 1St Street. Although I was asked twice, and S 2nd at the end of my block was RPP, We never had RPP while I lived there. I wouldn’t sign, and the guy next door was the manager of Polvos Restaurant and he wouldn’t sign for obvious reasons, so didn’t happen. If all houses on either, or both sides of a block have kerb cuts or alley access, that’s a disqualifying condition for RPP. You already have nearly 8ft of public road reserved by your kerb cut. It’s not the cities problem if you use your garage for storage or park a trailer or old klunker on your drive. Nor is it the cities problem if you have 3-cars in your house, park parallel to the kerb cut and work it out. You can’t have RPP if people block your drive. That’s already an offence, call the cops, get the cars towed. Minimum price for RPP is the cities price per Sq yard for road maintenance and rebuilding. One side is 1/3 of the total price of the block length, want 2-sides then that’s 2/3 of the total price of the block. If your block is 270ft long, minus 20ft at each end for turning, that’s 240ft by 29ft giving, 773.33 sq/yds. Typical paving cost, is circa $31.40 per sq/yd for residential streets. 773.33 x $31.40 = $24,178. Divide by 1/3, or 2/3 depending on what RPP you want. That’s the upfront cost, in this case for both sides circa $18,600. Obviously streets are assets, otherwise you wouldn’t want to reserve space on them. Now you have to maintain the asset on yearly book value. You’d need to estimate how many years the RPP would run for, 25-years would likely be a good road lifespan. You then pay into ROF (road owners fund) that the city maintains for you to rebuild the road. Annualized, maybe $5k per year? 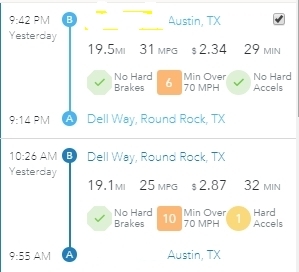 If 2. above seems too complicated, you have to pay the TXDOT Road User Costs Per Vehicle Hour, it’s currently $29.35 per hour. Want ten hours per day on Saturdays and Sundays. That’s $587 per week, but for that you get a side of a block rather than a single space. No kerb cut? No problem. Since you bought the house at market price knowing it had no off street parking you can have the frontage of your house reserved, put a kerb cut in and use your yard. Doesn’t work for you? Ruins the neighborhood character? Sorry, not sorry. 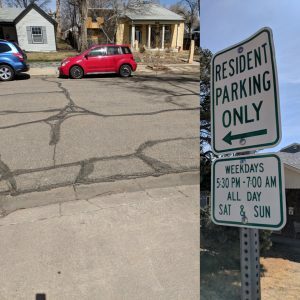 You are not entitled to park on a city street just because you live there, anymore than everyone else. Unless you moved in 80 years ago, you only EXPECTED to be able to park there, there was no legal agreement. Times change, so does need. Move on, literally. Finally, Meghan, was a little disingenuous when she mocked residents about the trash issue. In my 10 years I had people walking across the front yard, stopping and urinating against the fence, including a woman hiking up her skirt and peeing standing up. I found condoms and tissues on my drive a few times, and once a syringe/needle. Really. I also had people park on my driveway while one ran out to get takeout. It’s more of a problem than simply trash. I was able to get a discount on my property taxes for all this commercial blight. Everyone else should do the same. So prop-1 failed, no bad rail, no gloating from me. We still have a major commuting problem. 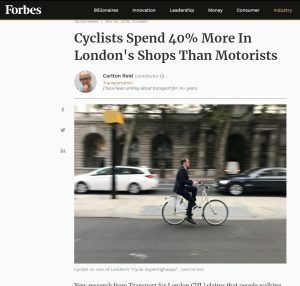 Repeat after me though, we don’t have a traffic problem. One of the problems we have, that comes from growth is so many places are having infrastructure work. Google are all over south Austin laying underground conduit for fiber optic cables, mostly though they are not the problem, apart from a half day here or there where the close off a lane. The RapidBus dedicated lanes have caused some problems downtown, but slowly people have got used to not using the bus lanes, although you still see the occasional complete screw-up with cars stuck in the bus lane, usually turning into the lane too quickly to make a left or right turn, and then along comes the bus. However, at least as noted before, what we have downtown is a really poor planning and implementation of the infrastructure work. As I said in this post back in January, This is another example of small city planning, big city desires. 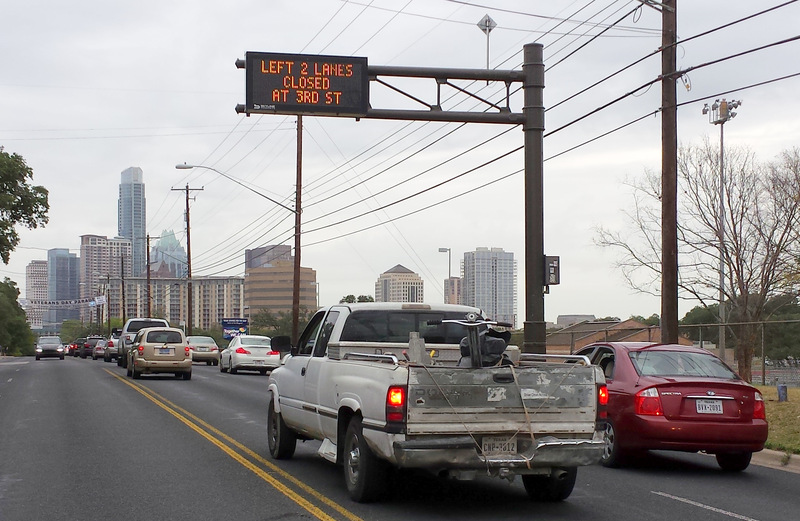 Lavaca St a core south/north route has now been effectively reduced to one lane for the most part of 18-months. Google maps unfortunately has some gaps, but streetview shows last year, with a picture from this morning. I wrote to city planning today, but I’m guessing there will be some plausible reason. The city needs to take control, there needs to be better coordination, less adhoc, private work, traffic lane planning and so on. I’d even have the city coordinate through the special events office to make sure that even temporary closure of roads to move cranes, scaffolding and other large construction materials in and out are coordinated. Finally, I’d implement a series of fines for companies that over run on repairs, irrespective of whom they are working for, or what the reason was. 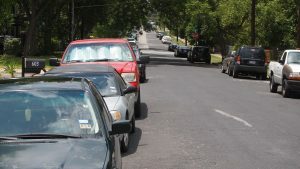 Congestion has a very real financial impact, if Austin really wants to be a big city, it has to start acting like one.